In 2008 the moveable feast of Corpus Christi falls on 22 May. 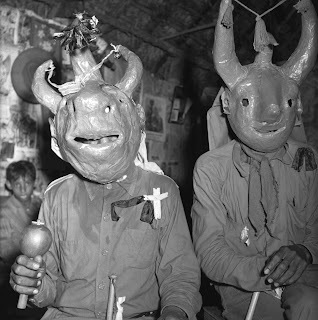 On that day Devil Dancers in San Francisco de Yare in the Tuy Valley will don their horned masks and red outfits and dance outside the church to pay a promise. The tradition harks back to the conquest and Spanish traditions transplanted to the New World. African slaves found in this day of the devil an opportunity to transcend their status at the bottom rung of society, to take control of the streets, and to challenge the church. Not surprisingly, several authors have found inspiration in this unique expression of Venezuelan folk culture. 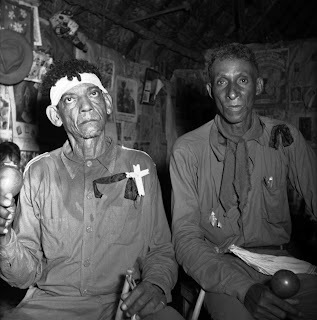 The photos are by Edmundo "El Gordo" Perez, who visited Yare in 1948. The first person to bring the Diablos Danzantes de Yare to a national and international audience was Venezuela’s most celebrated novelist, Romulo Gallegos (1884-1969), the author of “Doña Barbara”, “Canaima” and “Cantaclaro”. “The devils, red from their horns to their cloth tails, wore colourful adornments and rattles of every kind, as well as some who were draped in silk and bells, which represented a great investment of money..."
"They invaded the entrance to the church... where the Holy Sacrament was on show, just as the sacristan was closing the doors. Then they stretched out, face down, on the brick floor in two parrallel rows, separated by the same width as the big doors, while the drums stopped beating. "The curveta and mina drums began again. One of the devils got up - the first in the lefthand row - turning a somersault on his hands that left him kneeling with his back to the church door, and then he got up, simulating the convulsive shudder of someone possessed, in order to shake the rattles he was wearing, and began a dance of jumps and swoops of extraordinary agility, pushing back his cloth tail in order to touch it on the wood of the door..."
"One by one... the devils took their turn, trying to repeat what the first had done, but each one making an effort to outdo the others in agility and skill. "Now all the devils began their dance. The general dance, without rhythm or beat, just a chance to make a noise with the drums, a whirlwind of somersaults, swerves and squats that filled the space outside the church. It was primitive Africa, even though it was reproducing in America a scene from medieval Europe, and possessed by the farce, they now became frenetic...."
The other writer to draw inspiration from the Diablos Danzantes de Yare was the influential Cuban novelist Alejo Carpentier (1904-1980), who came to Venezuela in 1945 and stayed untilFidel Castro and his band of bearded revolutionaries ousted the dictator Batista in 1959. “...they advanced slowly, in little skips, behind a kind of leader or master of ceremonies who could have played the role of Beelzebub in a Passion Play, of the Dragon, or the King of Madmen, with his devil’s mask of three horns and a pig’s snout." Click here to see Alejo Carpentier's classic novel "The Lost Steps"